After dinner I tried to explain the appeal of shoe trees to my mom. Part of it is the appeal of ritual, I said. It might be a commemoration of the end of summer, a gathering or a stressful time. It’s a whimsical, random, group creation. There is an amusing quirkiness about it that makes you want to contribute…my brother and I wished that we had old shoes that we could throw. Some view shoe trees as nothing less than littering. Others see them as a desecration of a lovely plant. Personally, I think that the tree might in some fashion appreciate all the attention. As someone who appreciates spontaneity and all things that connect people in positive ways, I love an occasional shoe tree. 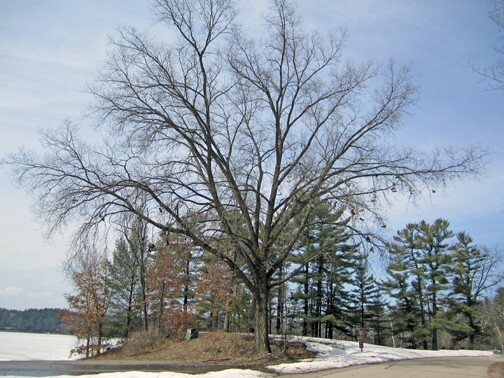 I wouldn’t want to see all trees, or even many trees, festooned with human cast offs. The fact that you stumble on such vigilante art projects infrequently is what makes them more appealing. I wonder if those who started this particular tree knew that there’s a history of using cottonwood trees for this purpose. 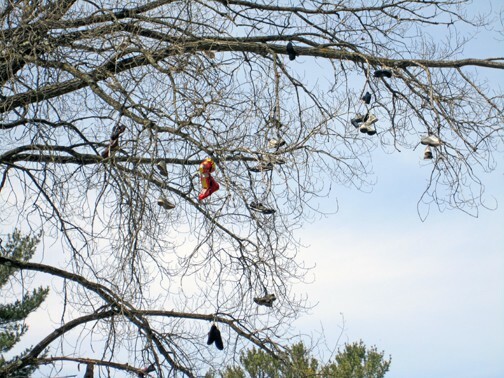 Was the tossing of the first pair of shoes in this tree an act of meanness or a spur of the moment bit of silliness? I’ll never know, but next time I come to central Wisconsin, I’m bringing an old pair of shoes.